With learning programs playing an important role in the contemporary museum sector, organisations need to have an understanding of the Australian Curriculum. But for many volunteers and non-education specialists, the process of wading through the curriculum can be overwhelming. Tony Coonan and Janelle Insley from Cobb and Co Museum present to the Tablelands Heritage Network via Skype at Malanda, Far North Queensland. Photo: Gwyneth Nevard. 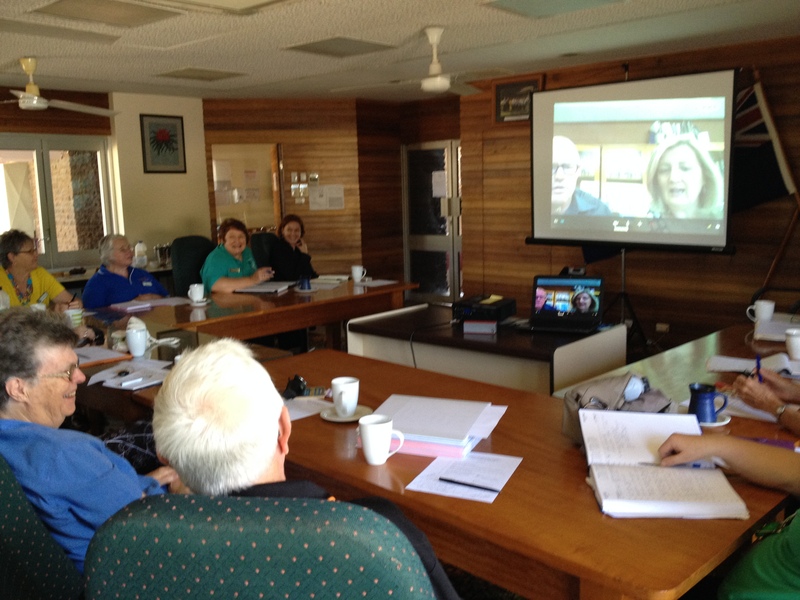 To help museums and interpretation centres on the Atherton Tablelands de-mystify the new curriculum, education staff based at Queensland Museum’s Cobb and Co Museum campus in Toowoomba recently participated in a Skype-based workshop run as part of the Tablelands Heritage Network (THeN) meetings. Tony Coonan, Education Officer, and Janelle Insley, Learning Programs Manager, outlined a range of strategies to help local museums and interpretation centres connect with schools in the area. This included searching Queensland Education’s database to create a geographically relevant contact list. Check it out here. Most of the groups in TheN have collections that reflect local history and technology, and Janelle and Tony were able to focus on topics that draw specifically on those areas. Have a look here. Object-based learning was also central to the discussion. Community museums, with their special association with “real things”, are perfectly placed to help students’ develop interpretation, interrogation and research skills. With limited resources to run specialised, face-to-face education training, Skype facilitated the community’s much needed access to QM staff. The response from THeN members has been enthusiastic and they will now focus on developing education materials for museums in the network. Posted on 18 November 2013, in Jo's Diary and tagged curriculum, education, Far North Queensland;, Tablelands Regional Council, volunteers. Bookmark the permalink. Leave a comment.